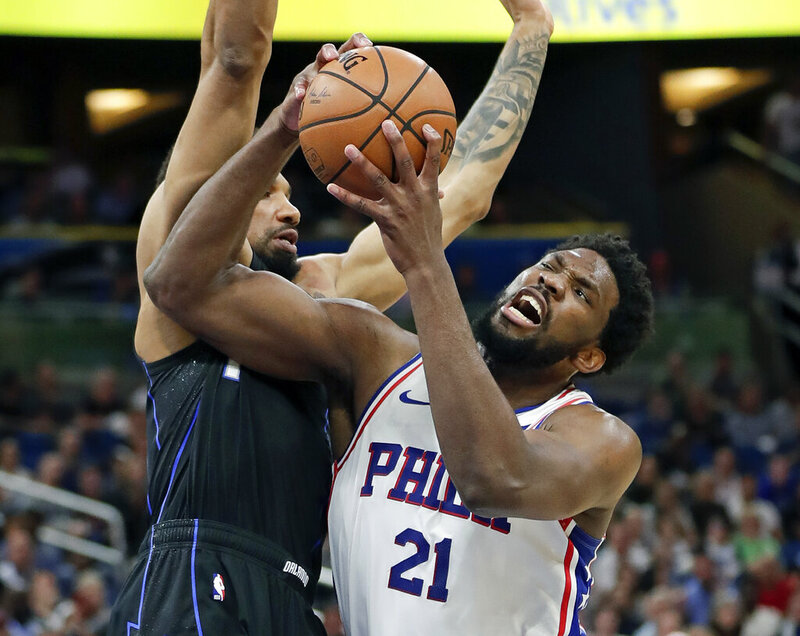 Orlando, Fla. (AP) — Nikola Vucevic had 28 points and 11 rebounds, and the Orlando Magic held the Philadelphia 76ers without a field goal for a stretch of nearly 12 minutes Monday night in a 119-98 victory. Evan Fournier scored 24 points for the Magic, who outscored the 76ers 30-5 over a second-half stretch in which Philadelphia missed 15 straight shots. The Magic completed their first 5-0 homestand in franchise history and moved a half-game behind Miami in chasing the eighth playoff spot in the Eastern Conference. They visit the Heat on Tuesday. Joel Embiid led the 76ers with 20 points and 10 rebounds. Playing without point guard Ben Simmons, the 76ers led 60-57 after shooting 61.5 percent in the first half. Shake Milton’s jump shot cut the Magic’s lead to 78-77 with 4:32 left in the third quarter, but Philadelphia did not score in the remainder of the period, falling behind by 14 points. When Zhaire Smith hit a 3-pointer with 4:50 remaining in the game, it ended a stretch of 11 minutes, 42 seconds without a field goal for the 76ers, who then trailed 108-85. Embiid overcame four early turnovers to put up 14 points and eight rebounds in the first half. His 3-pointer opened a 10-0 run that quickly erased Orlando’s seven-point lead midway through the second quarter. Fournier’s 14 points in the third quarter helped Orlando move ahead, and Vucevic’s 3-pointer put the Magic ahead to stay midway through the period.